It travels only at night. It stands three feet taller than the average human. It wields incredible strength. It's been called Sasquatch, Yeti, Orange Eyes, Mud Monster ... Bigfoot ... and the people of Ambrosia believe it is only a legend. 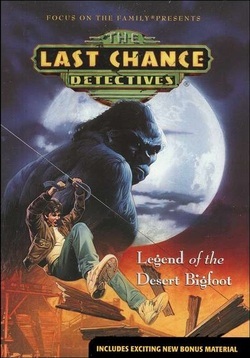 Legend of the Desert Bigfoot explodes onto the screen, plunging Mike, Ben, Winnie, And Spence into a mystery they could never have imagined. Long, coarse strands of animal hair the vet can't idnetify... old Silas's wild story ... metal doors ripped apart by powerful claws ... terrorized campers ... and in the middle of it all, a dog named Jake, who captures a place in Mike's heart. An exciting lesson about integrity.